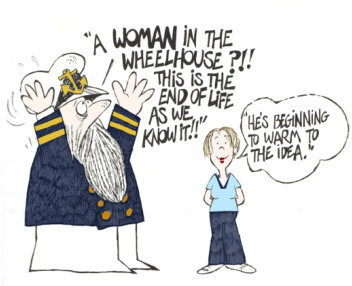 Traditionally, ships are places where women shouldn't be, said some men. But why stop half the population from being mobile in this way? And how can women fulfil their potential by roving and becoming all the things they never even dared to dream of on land. Exploring women's maritime pasts is what a few historians are doing, such as Margaret Creighton, Lisa Norling, Joan Druett and Suzanne Stark. I've been exploring in this way since the 1980s. Pirates and pursers, dancers and doctors, captains and cooks: I've written and talked about women in most seafaring occupations. (And I'm always impressed. Do I myself fancy seafaring? No, I get too sick!). Commodore Muriel Hocking RD* Royal Naval Reserve, the first and only woman in command of the RNR and the navy’s first ever female commodore. 'A meticulously researched tribute to women's immense contribution to naval service, mirroring their sisters' with the air force and army. Mary Mackie, author of Wards in the Sky: The RAF's Remarkable Nursing Service. Commodore Carolyn Stait, CBE, Naval Base Commander Clyde (Faslane), 2004-2007. Please post your seafaring stories and pictures on the From Cabin Boys to Captains Facebook page. This book succeeds admirably. It is by turns questioning, sceptical, imaginative, personal. The authors reconstruct, suppose, and above all, tell what can be known. It's written with wit and a light touch. Women who wanted to work at sea faced stiff resistance in the 1970s in the Merchant Navy and in the 1990s in the Royal Navy. It's sometimes still a challenge. Picture courtesy of Sally Fodie. Summer 2017: Stories of pioneering stewardesses who sailed to West Africa, on the forthcoming website of the Elder Dempster Lines Heritage Archive Project. Stewardess Julia Andrew sailing on Elder Dempster vessel c 1926. Photo courtesy of Grace Pritchard. At the many talks and conferences I do. So watch this diary and Blog for the latest news. Stanley J. 2018. 'Tugboat Annie and women seafarers in Western Europe and Northern America since 1750,' in Horacio-Guillermo Vazquez Rivarola, ed, Women in the Merchant Marine II: Africa, Asia & East Europe, Buenos Aires, tbc. Stanley J. 2018. 'Frocks versus guns: UK seafaring women and queered people sailing the South Atlantic in the 1982 Malvinas/ Falklands conflict', in Birgit Braasch and Claudia Andrea Müller, eds, Off Shore: Perspectives on Transatlantic Pleasure Travel since the 19th Century, Lit-Verlag, Hamburg. Stanley J, 2018. 'Questing for Couba Cornwallis, Nelson's Afro-Caribbean nurse', Trafalgar Chronicle, no 28, London tbc. Stanley J. 2012. 'On buffer-kissers, bus-station skanks and mile-high clubs: sexualities and transport', in Peter Norton et al, eds, Mobility in History, The Yearbook of International Association for the History of Transport, Traffic and Mobility, Berghahn, New York, 29-49, http://dx.doi.org/10.3167/mih.2013.040104. Stanley J. 2009 'Caring for the poor souls: inter-war seafaring women and their pity for passengers,' chapter in Gayle Letherby and Gillian Reynolds, eds, Gendered Journeys, Mobile Emotions, Ashgate, London, 121-132. Stanley J. 2007. 'The Women among the boys' in Robert J Antony, ed, Pirates in the Age of Sail, Norton Casebook in History, WW Norton, New York, 153-166. Stanley J. 2007. Entry on women, Oxford Encyclopaedia of Maritime History, Oxford University Press, New York. Stanley J. 2004. 'Go east, young woman (but not often): inter-war British India Line stewardesses', in Richard Harding et al, eds, British Ships in China Seas: 1700 to the Present Day, National Museums, Liverpool, 99-112. https://tinyurl.com/go-east-women. Stanley J. 2017. '(Actively) moving missing "minorities" from the margins to the main in maritime museums', Topmasts, December, 37-41. https://snr.org.uk/wp-content/uploads/2017/12/Topmasts-special-issue-rev.pdf. Stanley J. 2011. 'Ayahs who travelled: Indian nannies voyaging to Britain in the nineteenth century', Black and Asian Studies Association Newsletter, January, 5-8. https://tinyurl.com/ayahsBASA20. Stanley J. 2010. 'We were skivvies / We had a ball: Shame and interwar stewardesses, Oral History, 38 (2) (Emotions issue), Autumn, 64-74, http://www.jstor.org/stable/25802191. Stanley J. 2009. 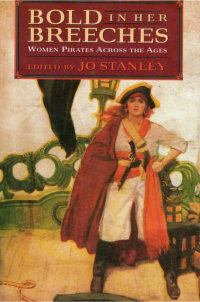 'The Trouble with Women Pirates', Her Storia, 1, Feb 2009, 5-13. https://tinyurl.com/trouble-women-pirates. Stanley J. 2006. 'How did this come to be in stewardess Scheherazade's sea-chest of 'memories'? Exploring the Exceptionalised and Auratic Sea through Inter-War Seawomen's Oral Testimonies', Diegesis: Journal of the Association for Research in Popular Fictions, no. 9, Spring 2006, Narratives of the Sea issue, 24-31, https://tinyurl.com/Diegesis-how-did-this. Stanley J. 2016. 'Seawomen of Iceland: Survival on the Edge' by Margaret Willson, Scandinavian Studies, 8 (4),Winter, 470-4, DOI: 10.5406/scanstud.88.4.0470. Stanley J. 2014. 'Women, Travel and Identity: Journeys by rail and sea, 1870-1940' by Emma Robinson-Tomsett, Women's History Review, April, 132-134, DOI: 10.1080/09612025.2014.906836. Stanley J. 2013. 'To be a Sailor's Wife'by Hannah Hagmark-Cooper, Women's History Magazine, 71, 40-41. https://tinyurl.com/Alandsailorswives. Stanley J. 2008. 'Gender, Emotion, Work and Travel: Women Transport Workers and Passengers, Past and Present', Greenwich Maritime Institute, University of Greenwich, London, June 2007, History Workshop Journal , 65, 277-279, https://doi.org/10.1093/hwj/dbn018. Stanley J. 2008. 'Grace Darling: Victorian Heroine,' by Hugh Cunningham, , Women's History Magazine, 58, Spring/Summer, 38. Stanley J. 2007. 'The Female Shipwright, Mary Lacy', by Margarette Lincoln, International Journal of Maritime History, Autumn 2009, 405-407, https://doi.org/10.1177/084387140902100146. Stanley J. 2007. 'In the Shadow of Freedom: Life on board the oil tanker,' by Mira Karjalainen, International Journal of Maritime History, 19 (2), 473-4, https://doi.org/10.1177/084387140701900245. Stanley J. 2006. 'Tourism and the history of traffic, transport and mobility', History Workshop Journal, 61, Spring, 298-9, https://doi.org/10.1093/hwj/dbi072. Stanley J. 2006. 'Beyond the Call of Duty: The Loss of British Commonwealth Mercantile and Service Women at Sea during the Second World War, by Brian Crabb, International Journal of Maritime History, 18 (2), 615-617, https://doi.org/10.1177/0843871406018002112. Stanley J. 2005. 'The Titanic in Myth and Memory: Representations in Visual and Literary Culture', by Tim Bergfelder and Sarah Street, International Journal of Maritime History, 17 (1), June, 329-30, http://journals.sagepub.com/doi/abs/10.1177/084387140501700135. Stanley J. 2005. 'Women of the Sea' by Edgar Rowe Snow, International Journal of Maritime History, December, 17 (2) 399-400, https://doi.org/10.1177/084387140501700240. Stanley J. 2005. 'Quite a Curiosity: The Sea Letters of Grace F. Ladd' by Louise Nichols, Journal for Maritime Research, January, https://tinyurl.com/Grace-F-Ladd. Stanley J. 2001. 'Women at Sea: An Other Category', thematic review, Gender and History, 15 (1), Spring, 135-9. https://www.academia.edu/642992/Women_at_Sea_An_Other_Category. Stanley J. 2001. 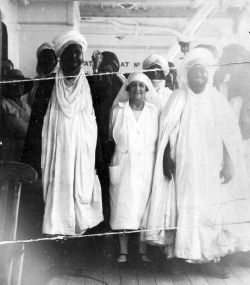 'Women at Sea: Travel Writing and the Margins of Caribbean Discourse', Lizbeth Paravisini-Gebert and Ivette Romero-Cesaero, International Journal of Maritime History, Winter, 325-27, doi/abs/10.1177/084387140101300174. Stanley J. 1998. 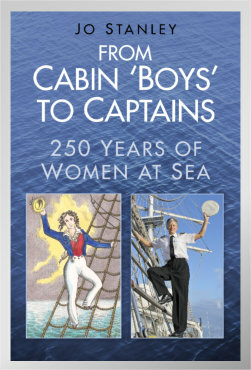 'The Captain's a Woman: Tales of a Merchant Mariner' by Deborah Dempsey, International Journal of Maritime History, December 10 (2), 329-331, http://journals.sagepub.com/doi/pdf/10.1177/084387149801000236.